I've mentioned before just how much I love receiving snail mail. Especially, when it comes in letter, card or package form rather than that of bills and credit card offers. This pleasure is tripled when what's delivered is handmade! So, it goes without saying that I was ecstatic when I opened my box today and pulled out two cards designed by two of my very talented blogging friends: Karen Blados and France Belleville! Yea!!!!! Aren't they gorgeous? AND, how cool is it that they both involve a red car? I love it! Thank you Karen and France! You rock. These cards are amazing! How much fun! Definitely frame-worthy, both of them! I'm jealous!! What I would love is a deck of cards with all of France's cars on them! How cool would that be! Enjoy your treasures and Merry Christmas! Lucky beans! 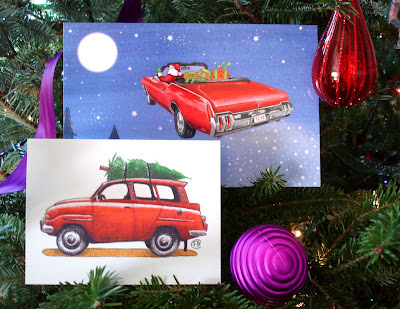 Yup, they look great on the tree and goodness, they'd look great anywhere! Karen and France rock big time! thanks again ... feeling pretty special to be next to franc's card.